Three subspecies are recognized: H. c. calcaratus from the extreme southeastern U.S. is delicate and brightly marked; H. c. maddisoni from eastern Canada and the northeast and east central U.S. is large, robust, smoothly and darkly marked; H. c. agricola from the prairies is much like H. c. maddisoni but bears a white stripe across the face. 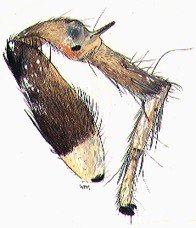 Superficially, the two northern subspecies resemble H. jucundus while the southern subspecies resembles H. notialis. 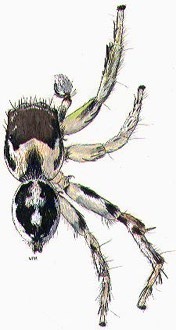 Habronattus calcaratus calcaratus male (Ocala, Florida), male third leg. © Wayne Maddison.